Today’s forecast was decent; not much sun but no gale winds so I drove down to Whitesbog. It was a great day; briskly cold, some occasional thin sun, and peacefully quiet. The kind of quiet that you suddenly notice. My only company was, from time to time, three pickups and a van. As you can see below, the slushy village street was empty, the old workers’ houses moody in the thin sun but with some modest touches for the winter holiday. Even on a largely overcast winter day there is beauty to be seen and enjoyed. On the right below, an ice-tree. 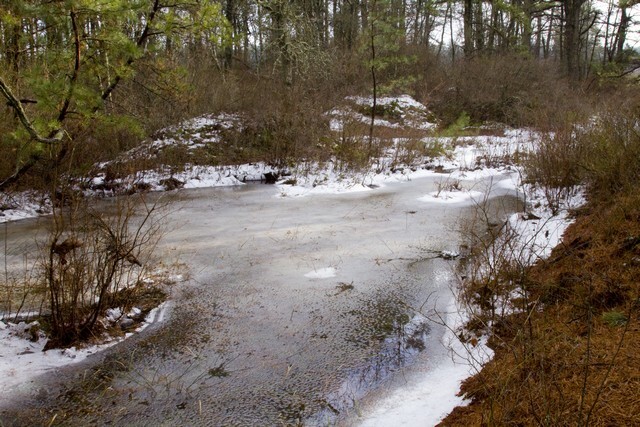 Here’s a typical pond, created by overflow from an adjacent bog. Its attractiveness is enhanced by the ice and the few remaining patches of snow. Finally, my colleague, Lou Dallara, had a lovely image of a clump of pine needles with snow on them as his first blog image of the new year. See his blog , scroll-find and click on Pine Needles. It brightened my day. The image below is the closest I could come. The snow’s gone but I loved the remaining droplets. Gee! you guys were just 10 minutes away from Sue and I where we live in Whiting. Next time you are going to be in the area give us a shout. Very nicely done and I like all these winter photos. 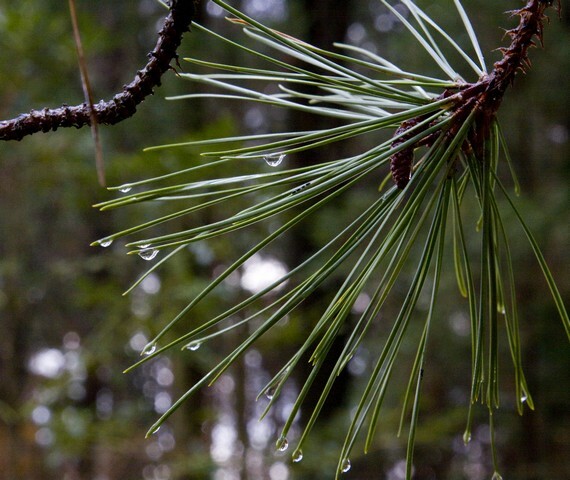 It’s great how you caught the droplets on the pine needles. Great ones Ralph ! I like the shot down that dirt road, look like a very old town, yep, a real Piney could live there. Very nice! I like the crack in the ice photo — it looks like a tree. That’s neat that they decorate the buildings with the evergreen and ribbons!